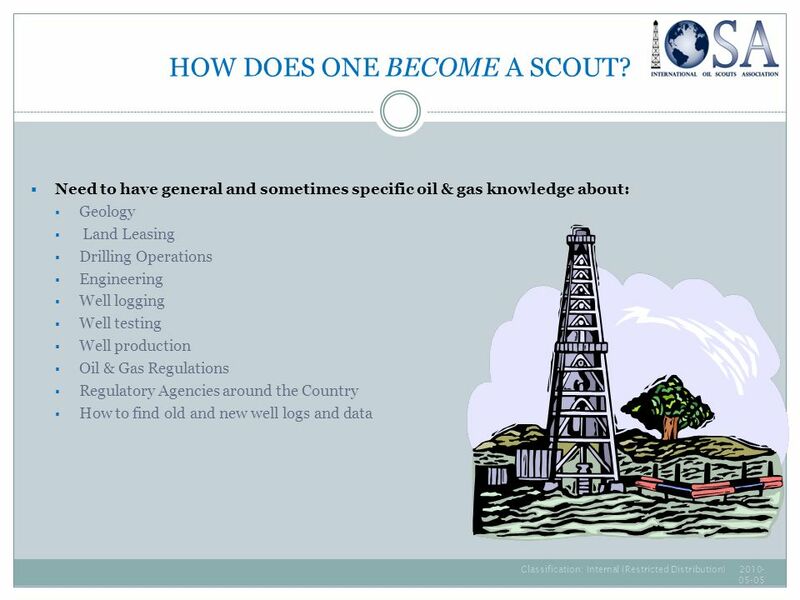 Oil Scouting is one of the most interesting and colorful professions in the oil industry, almost as old as the industry itself. 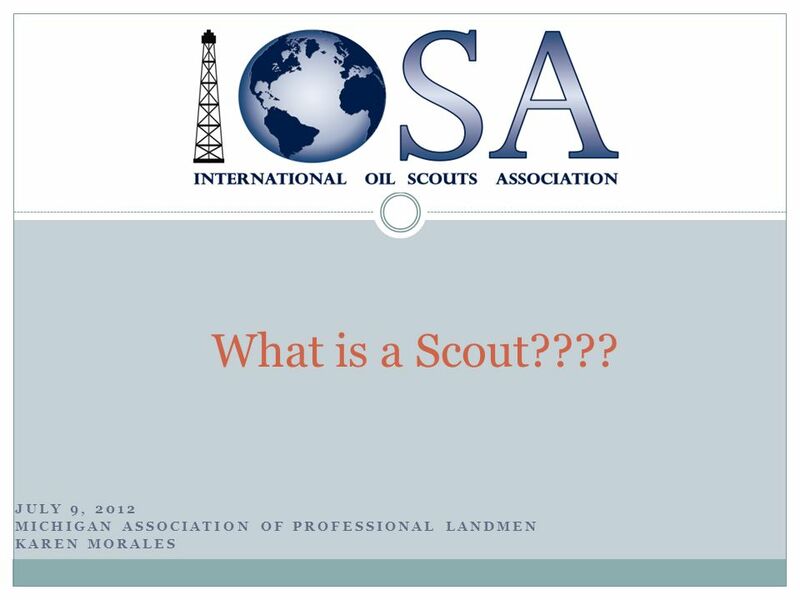 What is a Scout???? July. 6 HOW DOES ONE BECOME A SCOUT? 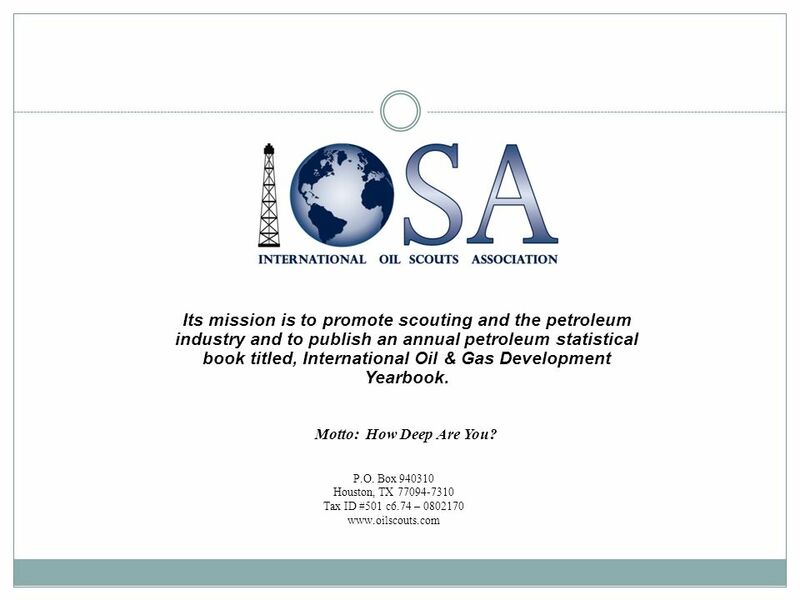 9 HISTORY OF IOSA The idea of an Oil Scouts organization originated during the early part of 1924 by Mr. M. G. (Buddy) Hale. 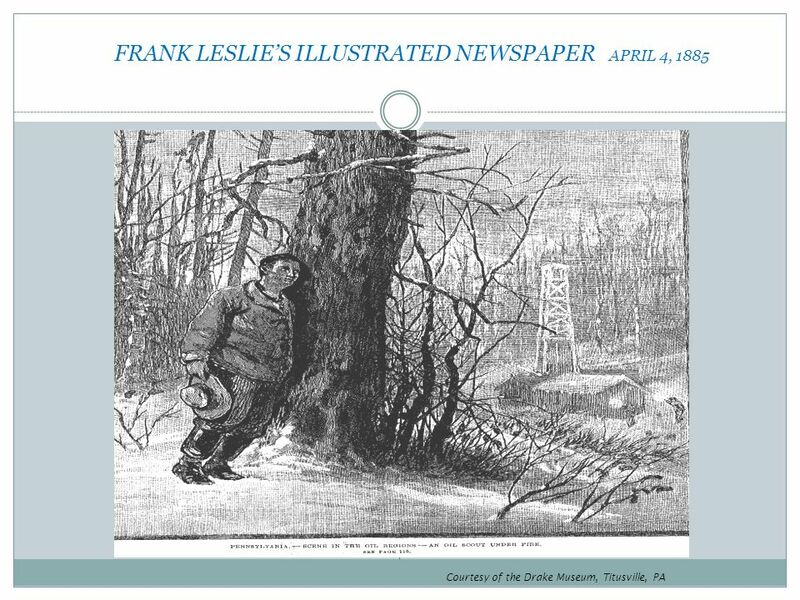 Through his efforts and cooperation of the Scouts located in Wichita Falls, Graham and Brackenridge districts in North Central Texas, the first meeting of a group of Scouts ever assembled was held in Graham, Texas. 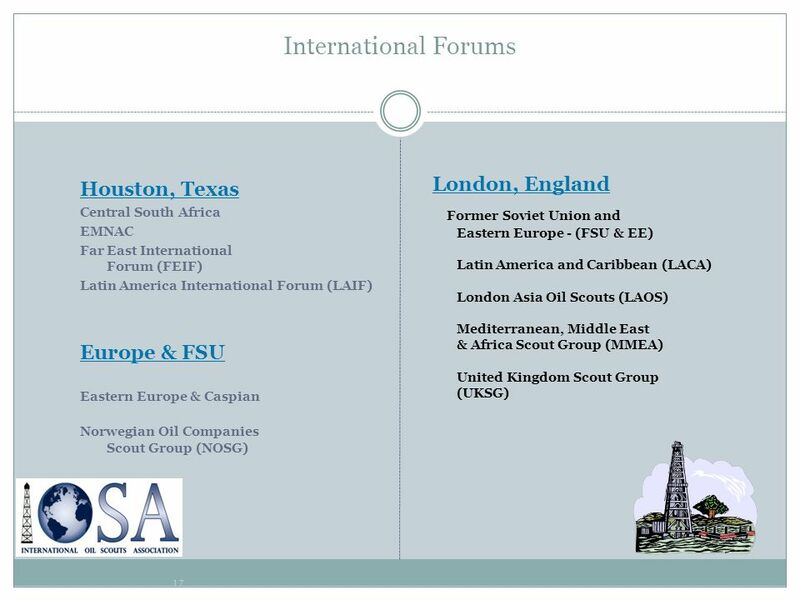 It was at this meeting that the idea of a permanent Oil Scouts Organization was initiated. 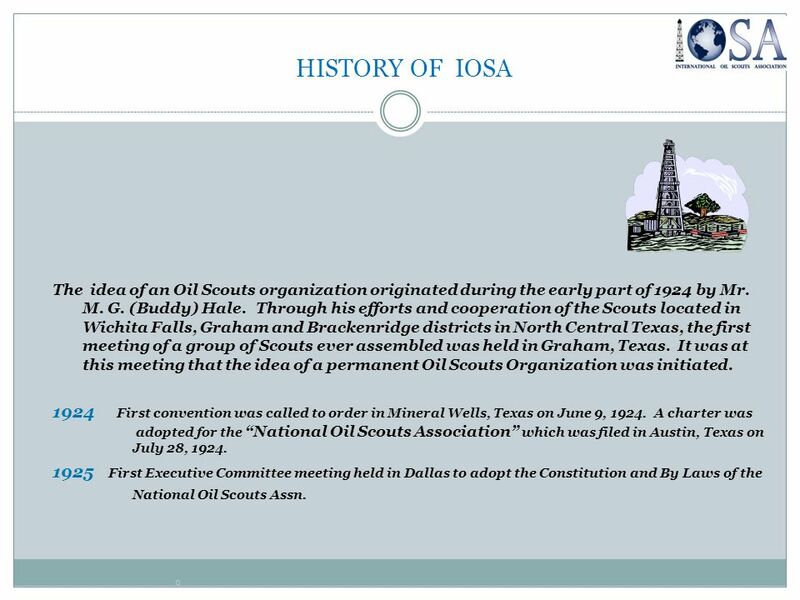 First convention was called to order in Mineral Wells, Texas on June 9, A charter was	adopted for the “National Oil Scouts Association” which was filed in Austin, Texas on July 28, 1924. 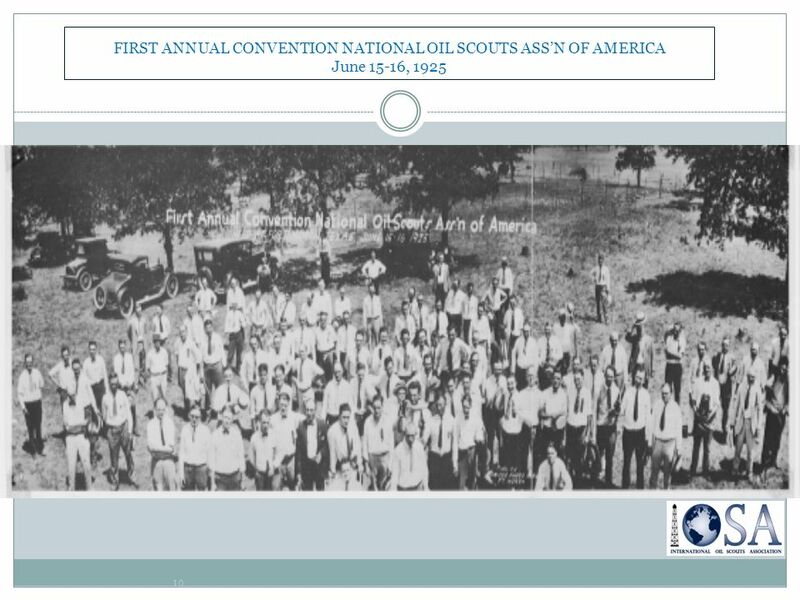 First Executive Committee meeting held in Dallas to adopt the Constitution and By Laws of the National Oil Scouts Assn. 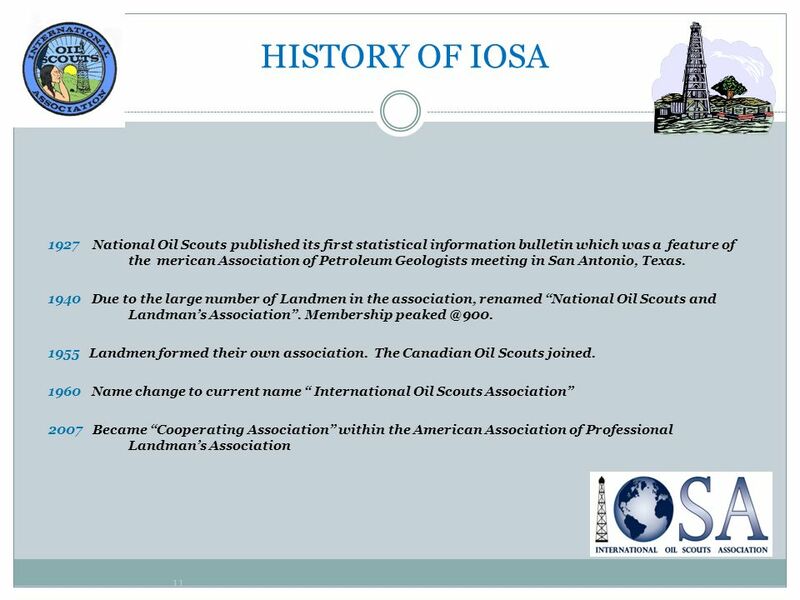 I.O.S.A., which was chartered in 1924, is a federation of district scouting organizations. 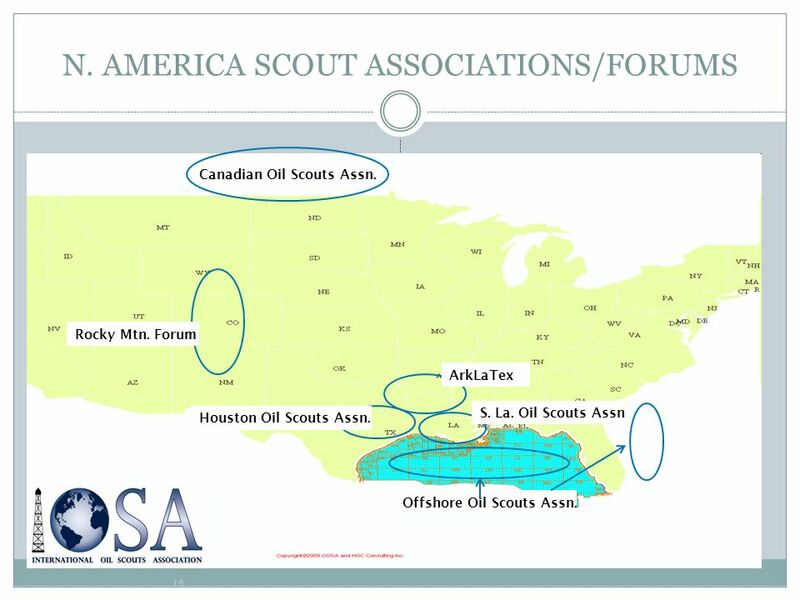 Offshore Oil Scouts Association Houston Oil Scouts Association Canadian Oil Scouts Association South Louisiana Oil Scouts ArkLaTex Oil Scouts Rocky Mountain Forum International Forums meeting in Houston & London Governed by a board of 9 Directors, meeting 3 times a year to plan publicity functions, annual meetings/seminars and to tend the internal affairs of the association. 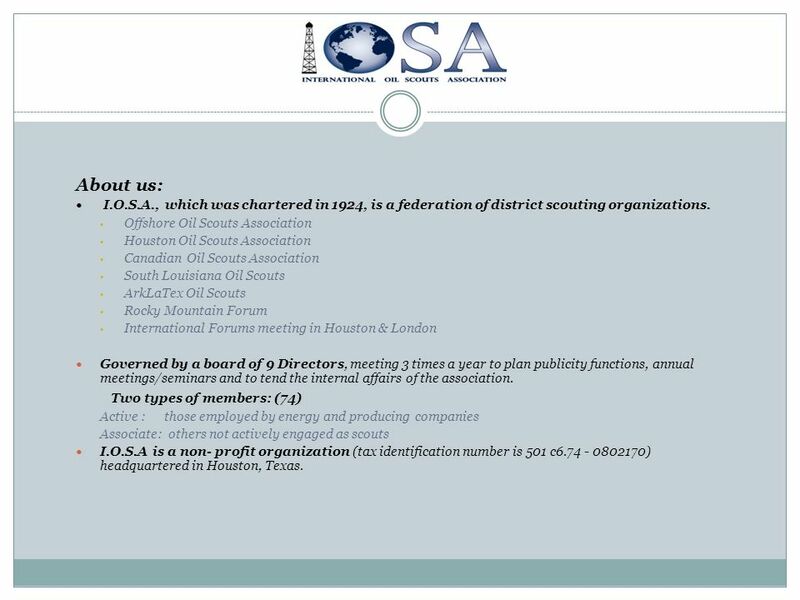 Two types of members: (74) Active : those employed by energy and producing companies Associate: others not actively engaged as scouts I.O.S.A is a non- profit organization (tax identification number is 501 c ) headquartered in Houston, Texas. 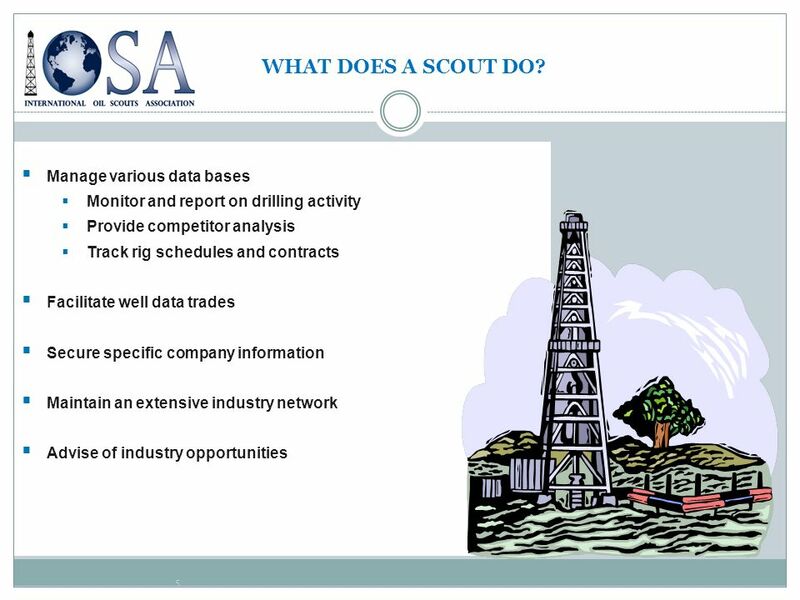 Canadian Oil Scouts Assn. Rocky Mtn. Forum ArkLaTex S. La. 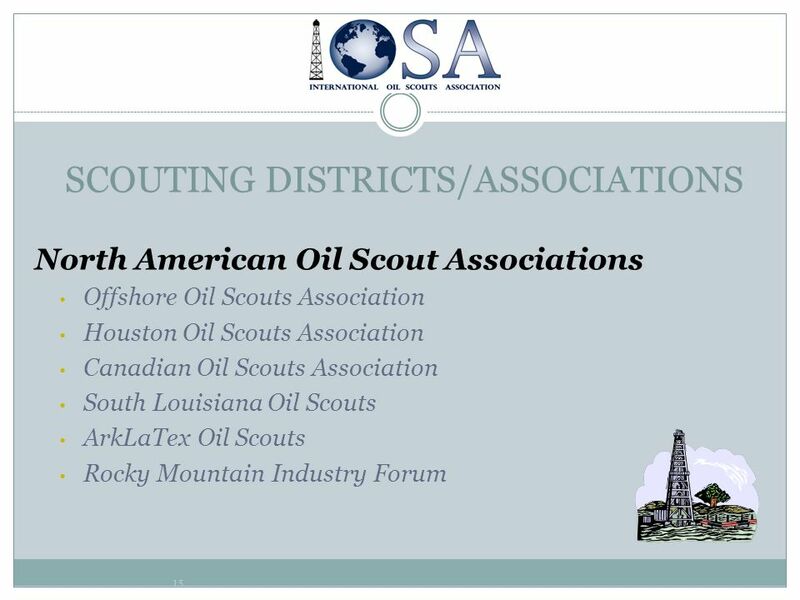 Oil Scouts Assn Houston Oil Scouts Assn. 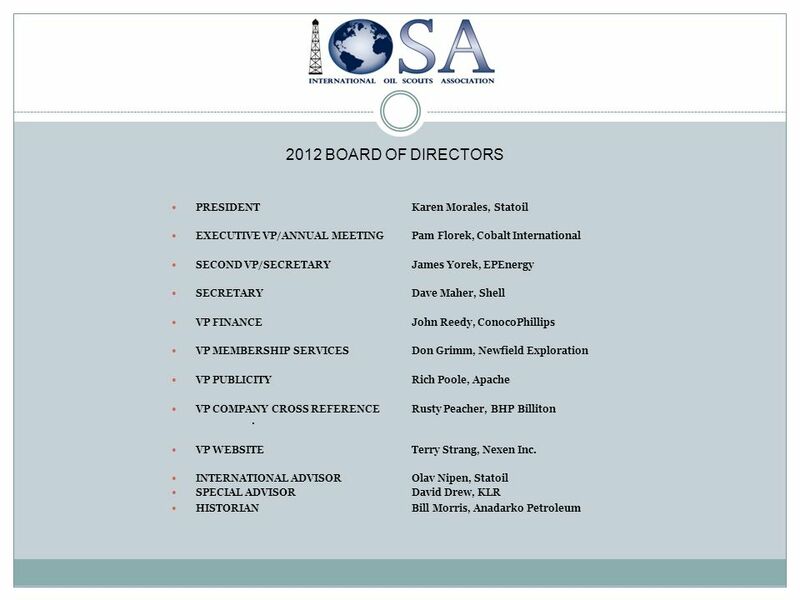 Offshore Oil Scouts Assn. 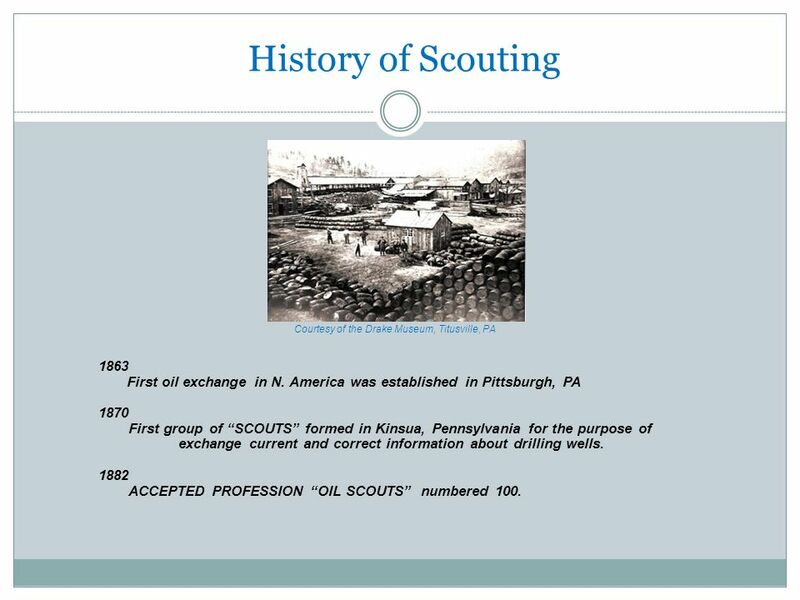 Download ppt "Oil Scouting is one of the most interesting and colorful professions in the oil industry, almost as old as the industry itself. 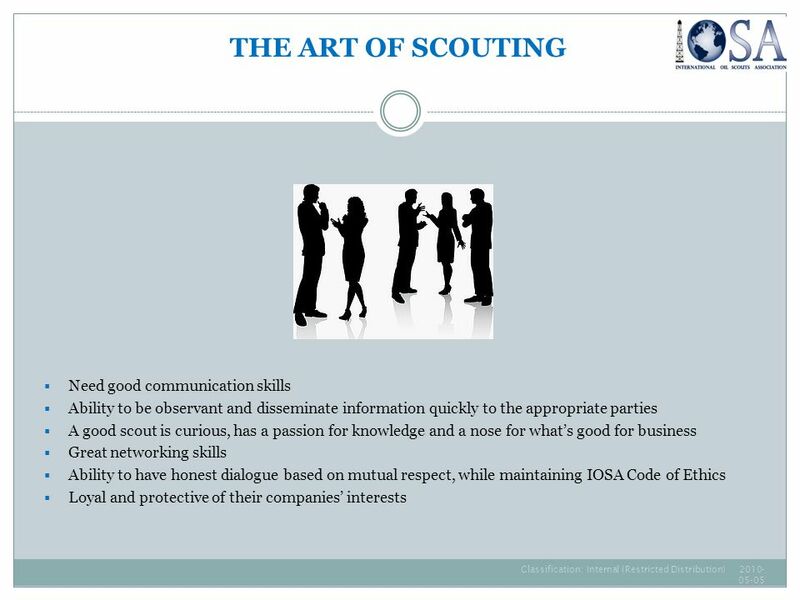 What is a Scout???? July." 1 Welcome to this Seminar for Board Members. 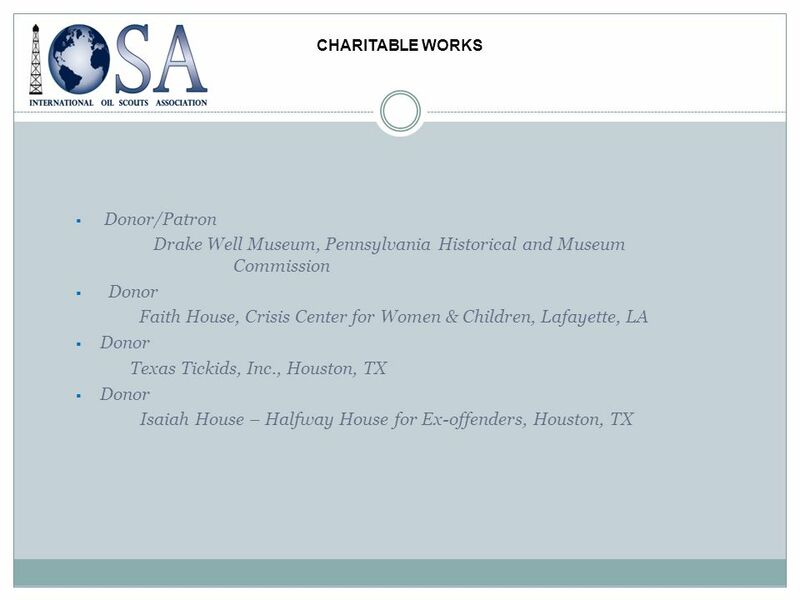 2 Board Members and Staff – Sharing of Responsibilities Voluntary Organisations and Volunteers Responsibilities. Presented By: Nellie Bhattarai, RPCV Nepal, The Toughest Job Youll Ever Love: The Peace Corps Experience. 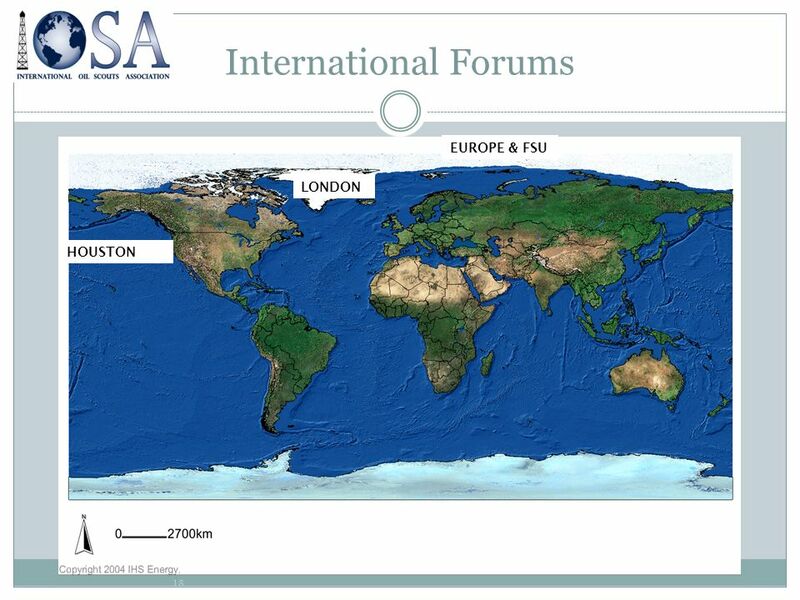 PROFESSIONAL SOCIETIES: MEMBERSHIP BENEFITS West Asia and Africa Region NACE International July 29, 2008. 1 The 4 th European ROCB/RTCs Meeting November 2011, Baku, Azerbaijan. THE OFFICE OF THE AUDITOR GENERAL AND THE AUDITOR GENERALS DEPARTMENT MEETING WITH REPRESENTATIVES OF THE COMMITTEE FOR MECHANISMS FOR THE FOLLOW-UP ON. OECD Work on Trade Trade and Agriculture Directorate Paris 2008. 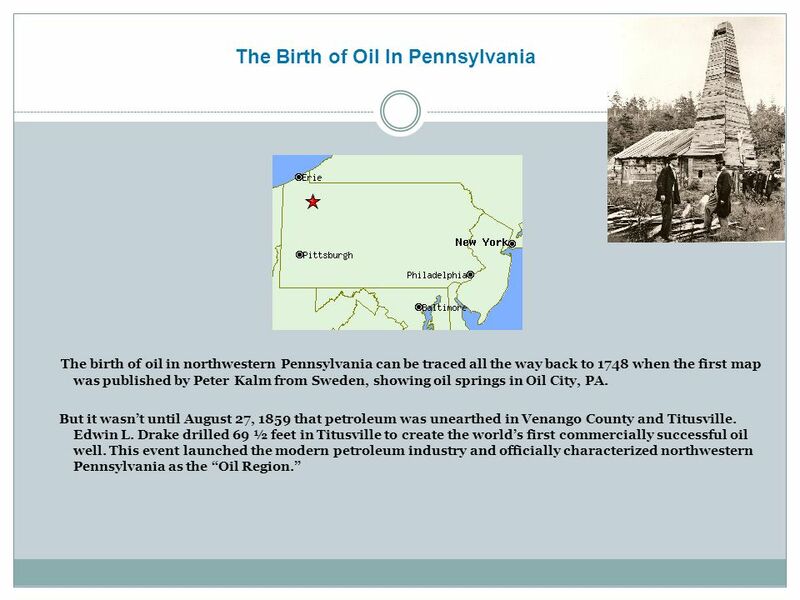 NFX Land VP Meeting_V2 1 Land and Land Admin – EKTi Research to-date Newfield Documents 1. A Version of G&G Competencies 2. Land Job Descriptions 3. Land. 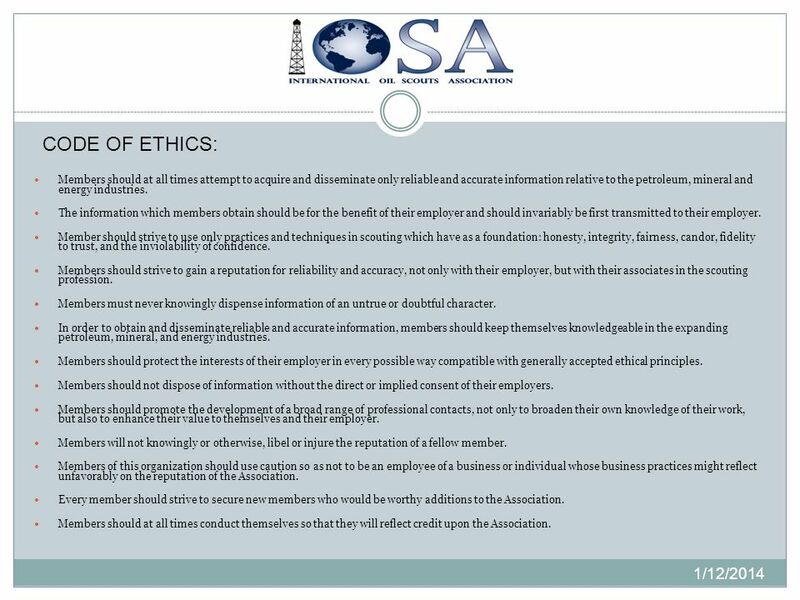 An Overview of EO. 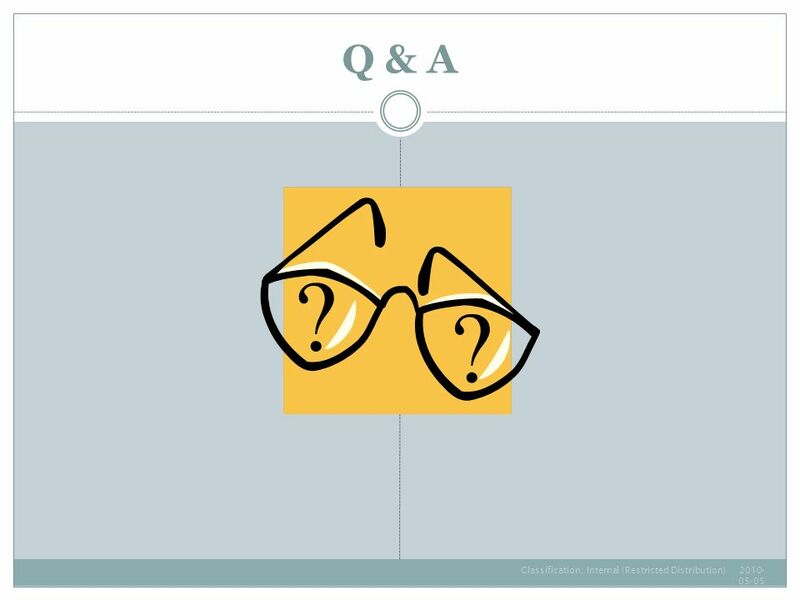 Fueling the Entrepreneurial Engine Agenda EO Overview EO Membership Benefits Application Process and Q&A. 1CPEAC/EHC CONFERENCE – 8 March 2009 Alberta & Oil: Where it has been and where it is heading for? Peter Yang, M.Sc., P.Eng. Manager, SAGD Specialist Group. IEEE and ACM Code of Ethics AEECS711 : Security Management and Audit Spring 2010 Presenter : Sara Mohseni Instructor : Dr. Hossein Saiedian. NORMAPME ISO User Guide for European SMEs The essence of.